What Hohner model might this be? Hello, just found this site. I play mostly acoustic guitar and 5-string banjo, and over the years, I've had a habit of trying other instruments. My wife saw an accordion in a local auction's listings and asked me if I'd be interested. Sure, if it's in decent shape, actually plays, and don't bid too high! (I couldn't go myself). Well, she acquired it for just $40us! 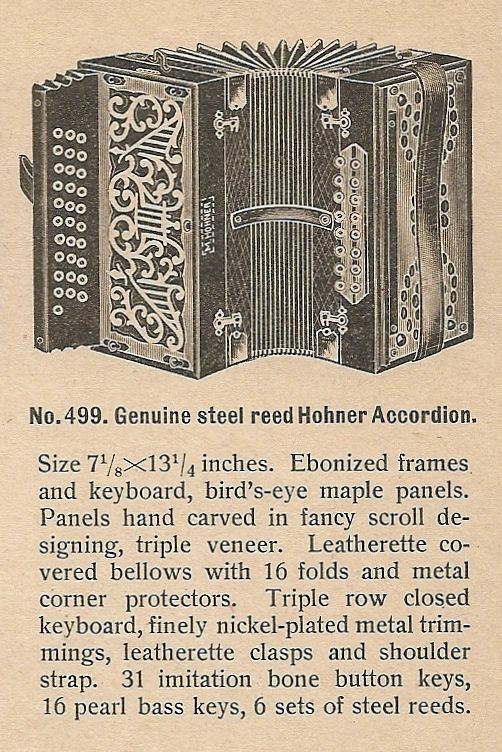 (very suspicious....) It's a Hohner melodeon, 31/16, F/Bb/Eb. Most notes play, but too many problems to play as-is. Numerous curved leather valves. The bellows has some poor repairs, including one with duct-tape . I hope to take on some minor repairs myself. Re: What Hohner model might this be? Not sure of the model # but it is at least 90yrs old. Most likely it will need a full rewax and valve job. It would be cool if restored. Ask the seller what the letters are stamped on the end of the keyboard next to the body. These should tell you the keys the instrument is in. I think he said F/Bb/Eb... It'll be interesting to see what Hohner used to put on 16 basses, though. Yes, this has "F B Es" stamped on the end. I first thought these were owner's initials (couldn't make out the last part initially), but read a post about the German letter names being stamped there. The other end is stamped 596 I think. Serial number? I found a listing of Hohner models on the internet. There were four that were available in 31/16 configurations. Italiener, La Corneta, l'Organola, and No.3701. Pictures of versions of the first three seemed fancier than what I have. Couldn't find a picture of the ca 1931 No.3701 model. The basses alternate (top to bottom) chords and root. Press to draw interval is 5ths except as noted. Here are pics of my messlodeon in case that eBay listing disappears. Front, back, that bungled bellows repair. It looks to be a model No. 499, as illustrated in my 1926 catalogue. Interesting, as an hour ago I discovered a date ( 2.3.26) and an indecipherable signature pencilled inside the bellows frame. No hint of a No.499 in that list I found, though named instruments may not show as a model no. Any chance you can photograph that page? Thanks. The long air "button" is a luxury. And the reeds sound so sweet. Wonderful! Thank you very much. I see a couple minor differences, scalloping at the ends of the "keyboard" and the wood plate under the bass buttons, but apparently this is it. EDIT 24 Aug: Hmmm, didn't catch the "6 sets of steel reeds". Mine has 5 reed blocks. Five reed blocks in the treble end or altogether? Perhaps I don't know the proper terminology. I thought the "sets of reeds" meant the whole block holding all the reeds for that row of buttons. Mine has 3 treble and 2 bass blocks.